"Everything depends on God and Putin." 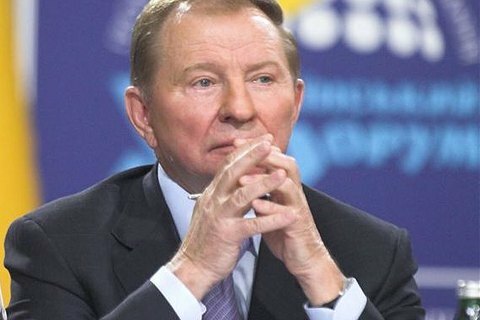 Ukraine's representative in the Trilateral Contact Group on the Donbas settlement (Ukraine–OSCE–Russia) and former Ukrainian president, Leonid Kuchma, has described there is no prospect for resolving the situation in Donbas in the near future. "I cannot see any prospect for resolving the Ukrainian-Russian conflict because there is no chance of achieving peace in this Ukrainian region with the steps that are being taken," Kuchma told a briefing in Kyiv on Friday, 17 November. Commenting on the recent talks in Belgrade between US Special Representative for Ukraine Kurt Volker and Putin's aide Vladislav Surkov, Kuchma criticised Russia's reluctance to accept most of the points of the annex to the UN resolution on the deployment of a peacekeeping mission in Donbas. "The United States suggested 29 points, of which Russia is ready to support three - and they say three is no nothing. Three is zero! Ukraine's position should be unchangeable: the UN peacekeeping force should be deployed across the territory of Ukraine, including Ukrainian-Russian border. What Russia has suggested – along the contact line – amounts to making a new border with Ukraine," said Kuchma. The ex-president also commented on the intensification of negotiations between Ukraine and Russia on the "all for all" exchange of prisoners of war, noting that the decision depends primarily on Putin. "This issue has been discussed for 14 consecutive months in Minsk – to no avail. This is really a big problem. Not a single person has been exchanged over 14 months. Everything that happens in Donbas and all the prospects depend on God and Putin," Kuchma said bitterly. At the same time, he noted that if such an exchange could happen before the end of the year, it would give "great happiness for families and friends of hostages". In September, Kuchma suggested UN peacekeepers can be deployed along the contact line in Donbas but also along the Ukrainian-Russian border.